Many Renaissance artists depicted the image of St. Catherine. The famous Italian brush master Raphael, who portrayed the Christian martyr St. Catherine, who leaned on the wheel, was no exception. The canvas was supposedly created in 1507, when Rafael decided to move from Florence to Rome. It should be mentioned that the very bend of the body of a woman, Rafael, borrowed from Leonardo da Vinci (the painting “Leda”), and drew some features from the group of Hellenistic sculptures that he saw in Rome. They inspired the artist to write a masterpiece of art. Why did Raphael turn to the image of St. Catherine of Alexandria? According to legend, it was her who Jesus called his bride, handing the ring. Under the rule of Maximian, the 4th century emperor, Catherine accused him of worshiping paganism and declared that she truly believed in Jesus Christ. Imperial greatness could not convince the saint, she was not tempted by the possible fame and wealth. After a categorical refusal to renounce her faith, Catherine was thrown into prison. The saint herself put her head under the sword of the executioner, and after the execution Catherine’s body was gone. It is impossible not to notice that Raphael depicted the female ideal of the Renaissance with brush and paints. Slightly pinkish skin, a blush on his cheek, copper hair, thick black eyebrows, a round face oval, slightly overweight shoulders. This is what a woman in the picture looks like – a symbol of vitality, which attracts with spiritual purity and strong faith. Painting “Saint Catherine” has a religious content. 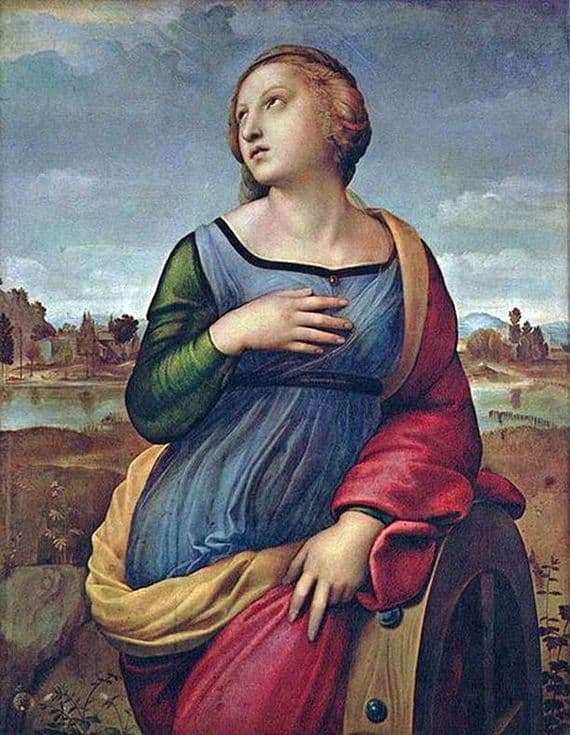 This painting by Raphael is considered one of the best in Italian art, which gives the viewer the artistic image of St. Catherine of Alexandria.